I’ll be honest: Even though I’m supposed to be a technology expert, I’ve long resisted using Siri and my smartphone’s voice commands. For the longest time, voice recognition on phones just wasn’t that good. All the errors were frustrating and often seemed to eat up more time than just typing in commands and opening up apps manually. 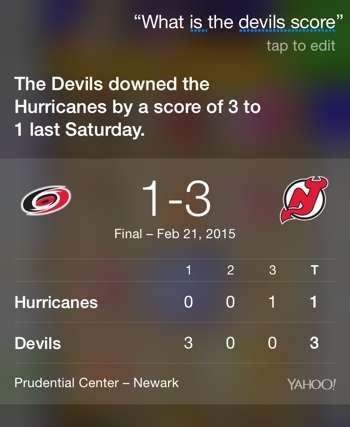 These days, though, I’ve found myself using Siri more often. Speech recognition has gotten a lot better, and Siri has gotten a lot smarter and more powerful. You can do virtually anything via your phone’s voice commands, from posting to Twitter to finding the best pizza pie to figuring out just how deep 20,000 leagues really is. Not sure how to get the most out of your phone just by speaking to it? No worries – those of us here at Techlicious have put together this guide of the 15 most useful phone voice commands for iOS and Android. Take a look and give some of these a try – I really can’t rave enough about how useful and easy these commands are. In general, Apple iPhone owners will want to issue voice commands through Siri (hold the home button); Google Android users should use Google Now (via the Google app) and tap the microphone icon. You can place a Google app widget on your home screen or, if your Android phone has a home key button, download the Home2 Shortcut app (free on Google Play) and configure your home button to launch Google Now with a double tap (Samsung owners may have to go to S Voice > Menu > Settings, and uncheck the second option to launch with the Home button.). iPhone owners can also download and use Google Now via the Google app for voice commands too, but Siri is more convenient. Most commands can be issued in plain English, as if you were asking your friend to do something for you. Want to make a phone call? 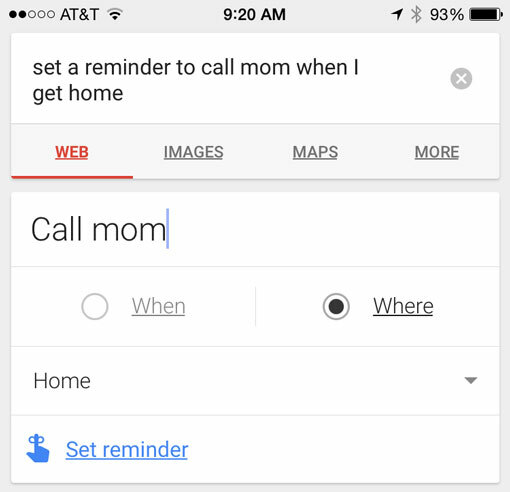 Then access Siri or Google Now and tell your phone you want to make a phone call. If your phone needs more information, it’ll ask for it. And, if you want to use nicknames, like mom, in your commands, you can establish relationships. On iOS devices, you can simply open Siri and say "my mother is 'Jane Smith'." Or, when you edit a contact, scroll down to Related Name and hit the +. The first, and default, relationship is mother. If you tap on mother, though, you'll see a list, including father, assistant and brother among other. You can also create a Custom Label. On Android devices, you can tap the microphone icon in the Google search box and say "my mother is 'Jane Smith'." Okay, so we’ve already covered the basics – to make a hands free call, tell your phone you want to make a call. You can tell your phone to call a specific contact (“call Dr. ### Spaceman,” “call mom”) or dial a specific number (“call 800-555-1234”). If you have multiple numbers for a contact in your phone, you can specify which you’d like to call: “call mom mobile” or “call mom home.” Easy! If you tell your phone to text a contact, it will follow up step-by-step by asking who and what you’d like to text. 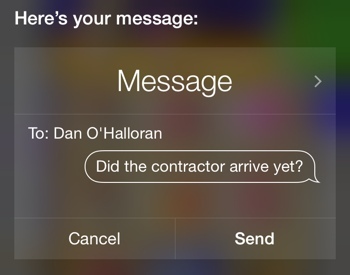 Or, you can just get it all out at once by saying, “text Dan, Did the contractor arrive yet?” Don’t worry if you flub a word or two – you’ll be able to correct your message if you mess something up (or if your phone mishears). You can add punctuation to your text by dictating it – just say “comma,” “period,” “exclamation mark” and the like when you want one entered into your message. Sending an email is simple, too – just tell your phone you’d like to send an email. It will follow up by prompting you for the recipient, subject and body in a step-by-step manner. Or, to save some time, give all the information to your phone at once: “email Anne, subject: Meeting, message: Can we reschedule our meeting for 3PM?” Note that for this to work smoothly, you’ll need to save people’s email addresses in your phone’s contacts. Once you learn to set timers on your phone, you’ll never burn the roast again. Just tell your phone to “set a timer for 20 minutes,” and the countdown will start immediately. Or, you can request to set an alarm for a specific time in the next 24 hours instead – say “set alarm for 1PM.” If you’d like to set an alert further in the future than that, you’ll need to set it up as a reminder instead. You can add an event to your calendar simply by giving your phone information about it. Say, “schedule meeting with Anne for 3PM” or “add trip to Canada to calendar for June 18 at 8AM” and your phone will know what to do. If you don’t provide enough information, as always, your phone will prompt you for more. Don’t know where you misplaced your favorite app, or simply want to launch Google Maps without searching for it? Just tell your phone to “launch [app name here],” and your phone will quickly obey. To play a song that you’ve downloaded to your phone, just ask your device to play it, e.g., “play Edge of Seventeen.” You can also request your phone play a specific artist, album or playlist by name. Have you ever wanted to know the name of a great new song playing over the radio or the speakers at the gym? 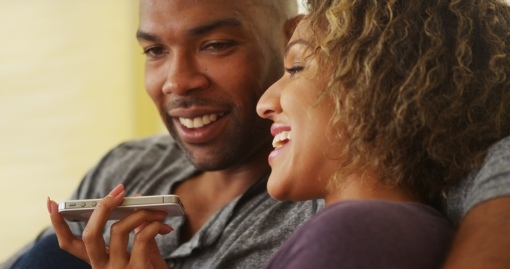 Simply ask your phone “What’s this song?” and point the receiver end toward the source. If the song is loud and clear enough for your phone to hear, it’ll be able to identify its name, artist and more. If you’ve chosen to integrate your phone with your Facebook, Twitter or Google Plus accounts, it’s an absolute breeze to post to social media via voice commands. Just tell your phone to “post to Facebook” and then the message you’d like to share as a status update. You can even ask your phone to tell you what’s trending on Twitter. Sure, you already know to get all your technology news and reviews here on Techlicious. But if you need to access content elsewhere on the web, just ask Siri or Google to perform a web search for you. “Search the web for delicious candy,” Siri! Hurry! I’m hungry. If you want to use Google search on your iPhone, you'll need to say "Google for delicious candy." Who’s the governor of Utah? How tall is the Statue of Liberty? How many inches are in 20 centimeters? Your phone can answer all these fact-based queries and more – all you need to do is ask your question in plain English. If your phone can't determine the exact answer, it will search the web for you to help find an answer. You can even ask, “What does the Fox say?” This is a really powerful feature, so give it a try! I tried to have Siri read incoming text while I was driving, but I had to unlock my phone first. Is there a way to tell it to unlock by giving your 4 digit code? Yes, you can access Siri when the phone is locked. If you go into Settings > Touch ID & Passcode > and scroll down to Allow Access When Locked, you can choose to enable Siri when your phone is locked. Thanks, but I do have Siri enabled to allow access when locked? I have IPhone 5s with latest IOS 8.1.3. Do I have to do something else? Yes. You need both enable Siri (Settings > General > Siri) as well as enable Siri to be used while the phone is locked, as I outline above. I tried to include a screenshot, but that didn’t work. What am I missing from your instructions? 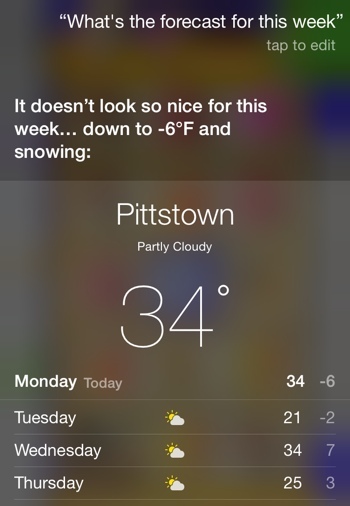 If you already have Siri enabled under general settings, you should be good to go. I just retried it with my iPhone 6. When your phone is locked, press and hold the home button and you’ll get the usual Siri prompt. Must be something to do with 5S because I do have Siri enabled and settings as I sent to you. Tried reading texts and sending email - have to input code. The case I have doesn’t let me use the finger touch. I’ll trying disabling that and see what happens. Kudos on the 30 Rock reference! Is there a way on apple or android to store the answers to the questions that you ask? How about a way to just make a list or create a note? On android can you change the command that is used to launch google now or are you stuck with “Ok google”? You can have Android make a note by telling Google to “make a note”. I t will then let you create a note and automatically email it to yourself. Voice command to unlock phone? I smashed 1/3 of my iphone screen so now only 2/3 of the screen works, and I can’t unlock my phone. Is there a way to unlock just using Siri? I have tried to call a person, call a number, send a text message, launch an app and search on Google . Everything is worked well. how to download this siri app in android mobil? my hands are paralyzeed and I am trying to find a cell phone or landline I can utilize without having to touch it to turn it on. I have to be able to turn it on using my voice. I know that such a thing exists. But I cannot find one to purchase. I figured if anyone would be able to know about this, it would be you. Please advise. If I understand you correctly, the Moto Voice app included in medium to high Motorola phones does just that. I believe those phones include a low power processor only to listen continuosly for the customizable activation phrase even while off, and recognize a lot of commands upon detection. I’m not affiliated with Motorola, I just have a Motorola phone. At least my “old” Moto X Pure does, Leslie. It uses the stock app MotoVoice. When the phone senses I’m driving or I’m at home, it yells “Incoming call from such and such, say ‘answer’ to pick up”, or “Incoming message from such and such. Such and auch said ‘bla bla bla’, say ‘answer’ to text back”. In neither case I have to touch the phone, it even hears me from an adjoining room if there is not much noise. Don’t know about the G5s, though. It should, it is 2 years newer than mine! Wow, it is an amazing article I found some new things it so thanks for sharing it with us.